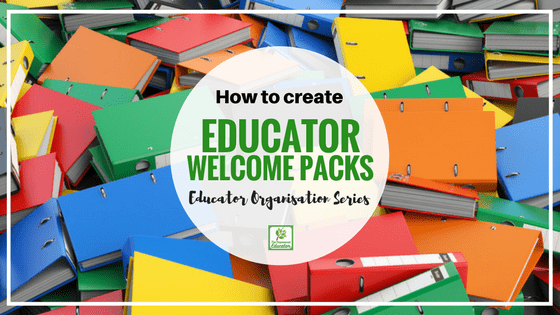 Have you ever considered using an educator welcome pack orientation to start off on a positive footing with new educators? I have worked across many community, family and early learning management roles in the past 30 years and one thing I can say for sure is that no matter the role everyone has different philosophies, work ethics and expectations. Interpretation is a funny thing – you might think everyone working around you is on the same page and yet suddenly find yourself expressing surprise and disappointment when you realise that isn’t the case or a staff member doesn’t seem to be ‘gelling’ as part of the team…but I hate to tell you that often it comes back to a leader and ineffective communication and orientation processes. There are many small actions you can initiate and processes you can put in place right from the start with a new team member to help ensure cohesiveness, morale and retention of empowered early childhood professionals which in turn leads to more positive outcomes not only for educators, but also for families and children. And I’m not talking about something that takes a whole lot of your already non existent time! With a little organisation and prep at the beginning of the year you will have the bulk of the work done and be prepared with a simple but effective orientation process you can implement again and again. Often we can be a little to quick to despair that a staff member is ‘never going to get it’ or ‘toe the line’ and other assorted negative phrases. But being a leader is about more than just directing, supervising or telling people when they get it wrong…again. It is not about micro-managing every single task because it’s just ‘quicker and easier’ to do it yourself. So what is it about then? For me it is about many things but I’m sharing my top 5 with you below. Everyone is different but I think the majority of leaders should all be aiming for at least 3 out of the list below! Mentorship and empowerment to foster continued learning, growing and doing. Able to identify professional development needs and finding options to help make it happen. Developing, sharing and maintaining clear expectations & guidelines for all roles and responsibilities in the workplace/company/scheme/centre/coordination unit. Ensuring consistency. Providing access to easy to understand job descriptions with performance indicators laid out clearly, how these are expected to be met on an ongoing basis and the consequences or actions for not doing so. Develop or help to communicate comprehensive and transparent processes for complaint handling (there always needs to be another option than just one person to bring concerns to), regular feedback and staff wellbeing. As part 2 of my Educator Organisation Series (Read part 1 on organising paperwork here if you missed it) I want to share one of my most effective strategies to lead and mentor educators. I have been doing this for years whether working in the early childhood or community services professions. It’s so simple to organise and once developed and put in place requires very little ongoing maintenance…so I often wonder why more managers, coordinators and leaders don’t do it. How do I know they don’t? Partly because I have seen it with my own eyes whenever I start a new position but mainly because many of the emails I receive from educators ask me to explain the basics of programming or what they should do as a new student or how to stop being confused or overwhelmed in their role. When I ask a few questions of them I usually then find out that they have been asked to do something but don’t know why or how to do it.They don’t feel valued or heard just because they aren’t as ‘qualified’ or they have been told to use a certain template or form without any training provided around this system which leads to frustration because they learnt or have been using a different way until this new workplace/centre/scheme. What do the 3 words below mean to you? They are all very important tools to have in that leader’s toolkit! But it would take more than one blog post to cover all those areas in detail and share every method I have learnt over the years regarding leadership and management (which are both very different things by the way) so I’m just going to share my all time favourite new educator leadership strategy with you to help you start taking action as a new year of work begins to unfold. The Welcome Pack Orientation- A Tool for Belonging and Becoming. To break that down for you….it’s basically an orientation pack for new staff. Yep, not rocket science, fancy or flash…but who said you needed that to help an educator feel worthwhile, consistent in their work, empowered and always ready to achieve new things? Regular readers know I like to keep things simple because frankly they usually work the best so why mess with that? So what is a Welcome Pack and why do I wish more early learning centres and family day care coordination units/schemes would use them too? Mine have taken many forms over the years (we didn’t have computers back in the day for this old educator you know 😉 ) but it is basically just a booklet of pages bound together or handed out in a folder to new educators beginning work or when you take over a new leadership role and begin to implement new processes and practices. You can make it as pretty or simple as you like but I do recommend giving them a professional, easy to read layout to increase the chances of the pack being kept safe and referred back to often! Choose a format that works best for your type of early learning service and how many you envisage giving out. You may want to save on paper and printing costs by keeping it digital and accessible to download any time from a cloud storage system like dropbox or maybe you would prefer to bind them or add to a ring binder folder so the educator has something physical to interact with. It really doesn’t matter – just keep it simple and easy to read! As well as including relevant information essential for the educator to know and understand I always ensure there are spaces for the educators to fill in required answers or ask questions to encourage interaction with the welcome tool. 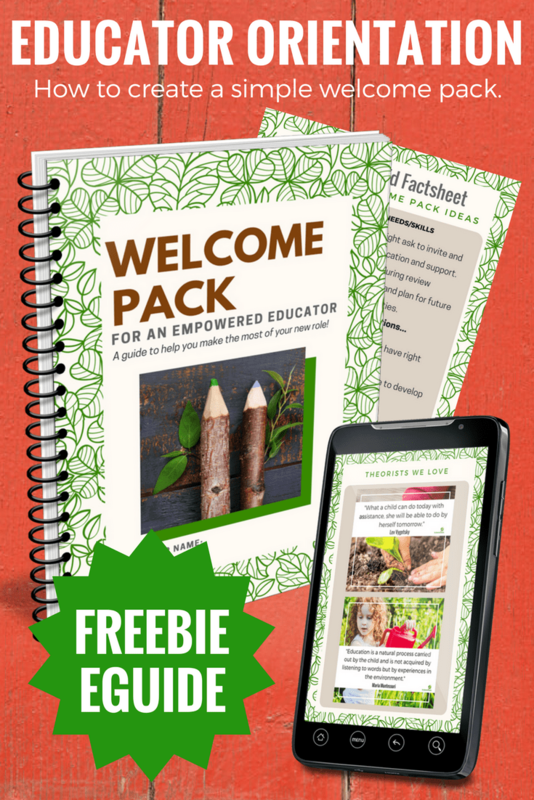 To download a free guide of what I usually include in my own Welcome Packs for Empowered Educators like the examples above you can click here or on the image below. I try to think of information that I would find useful and boost my confidence if I was walking in the door to a new workplace or opening my home daycare business for the first time. Think about the following as a start when developing your own welcome pack resource. What do I need team members to know and appreciate about this service? What do they need to know about their responsibilities and particular tasks expected from this role to perform it well? How can I ensure they understand our programming and adminstration system and the tools we use everyday? How can I communicate the current daily routines we follow? How can I empower, provide opportunities for professional development and encourage this educator? How can I ensure they know how and where to give feedback, discuss a complaint or seek help before letting their frustration, anger or overwhelm become a tool for conflict? How can I ensure there is a system in place to regularly connect, guide and work through this document with team members? How can we communicate the importance of educator wellbeing? But how do I actually use the welcome pack to keep organised and lead teams effectively? I’m glad you asked! 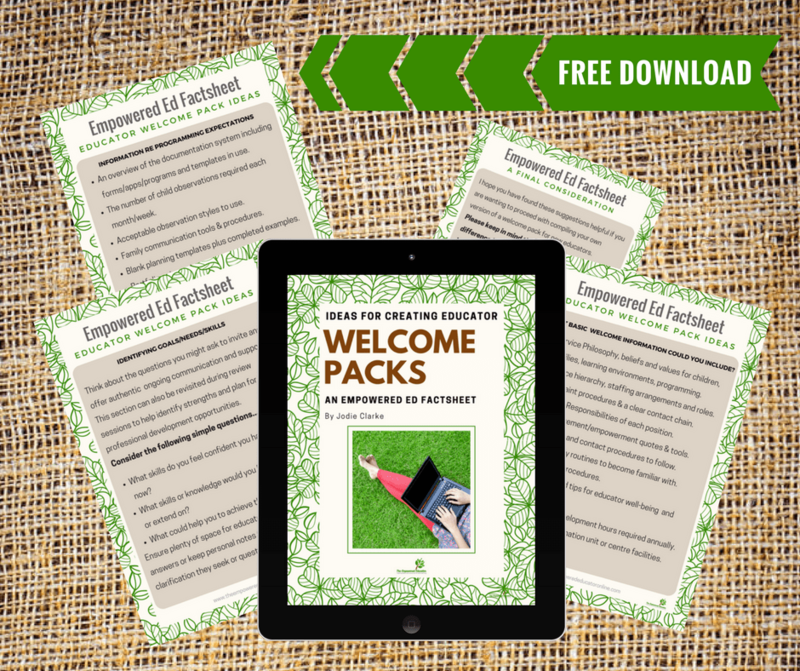 How to use an Educator Welcome Orientation Pack. Arrange a set time to meet when there will be no distractions. Hand out the Welcome to Work Pack . Take 30 minutes to talk through the service philosophy, roles and responsibilities of their position and the planning, documentation and programming expectations required. Ask for questions and then LISTEN. Identify any possible areas required for additional in service training. Arrange a time to meet again in 2 weeks to discuss any further questions, highlight positives or mention areas that may need to change. Schedule time to meet monthly (at a minimum for all staff) after that. Please keep in mind that there is a difference between an educator welcome orientation pack and a formal induction process. 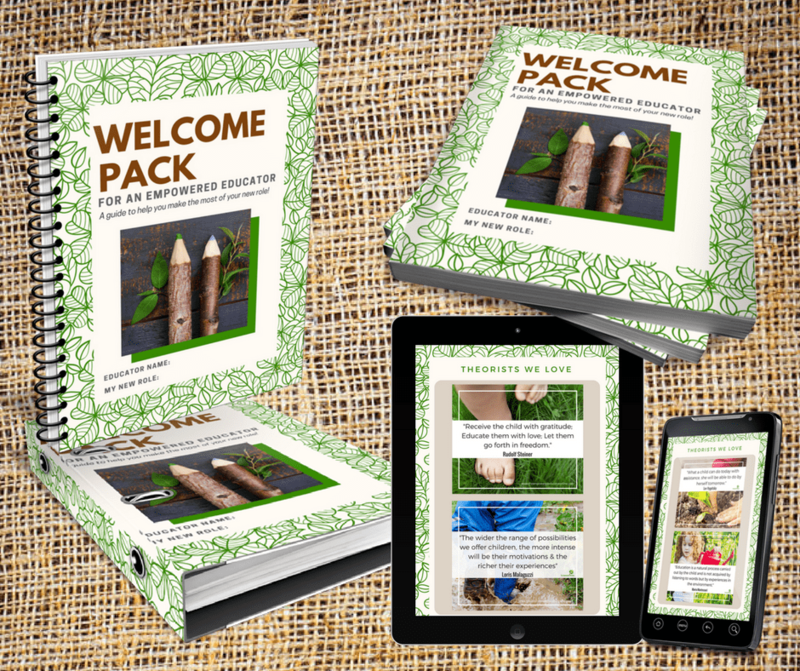 I view a welcome pack initiative as more of an informal orientation type experience. An induction consists of the formal training and service requirements that an educator must complete in the early stages of their employment. Some of the welcome pack could of course be incorporated into a formal induction process but it must never be considered as sufficient to replace it. View it as another tool in your arsenal to help provide quality outcomes for children, families and staff members! A welcome pack type orientation may seem like a simple process that couldn’t possibly provide the outcomes I have mentioned but believe me, it really does work toward dismissing many of the usual problems that occur in the first few months of a new educator coming onboard or you stepping into a new leadership role. And it works for early learning centres as well as family day care. For FDC it becomes the scheme role to ensure orientation/welcome packs are developed with the unique needs of a family day care educator in mind and then the coordinator/child development officer/support educator’s role to meet with their educator and work through the pack together with the appropriate follow up sessions. It is important to understand that these follow up sessions aren’t just for the leader – they are also for the team member to express their thoughts or frustrations, to ask questions and clarify, to be recognised for doing a great job or trying hard. A leader who shows respect and finds ways to empower their educators and team will receive that back tenfold. Don’t just tell…use the welcome pack to open a discussion and ensure everyone is on the same page. You cannot expect someone to always perform at their best or know how to improve and learn new skills if they don’t feel valued, respected and heard. It works both ways! 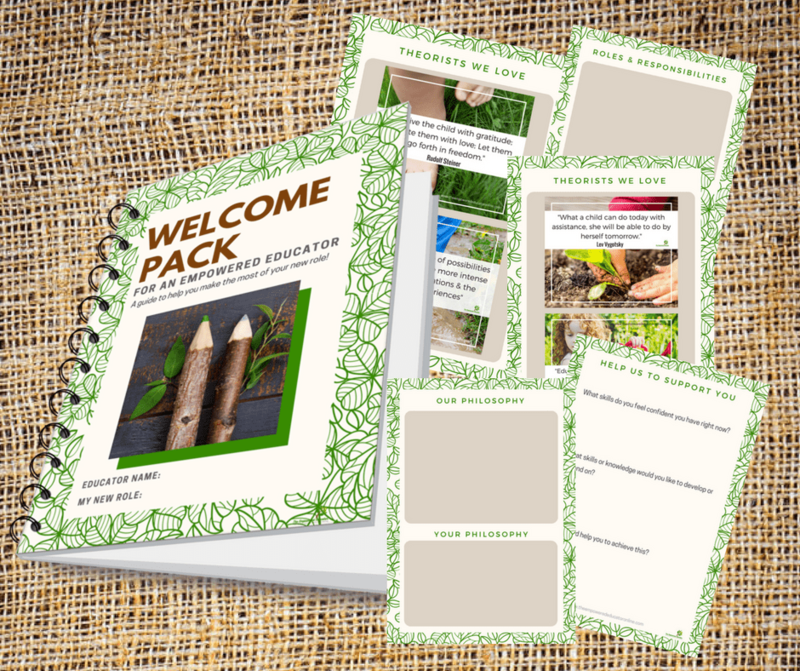 This welcome pack for Empowered Educators takes a little time to pull together but once done you only need to review every 6 months and perhaps make minor changes here and there. I always keep at least 5 printed and compiled in a folder ready to go so I can just grab as needed. You will be amazed at how much this simple tool can help with your organisation and leadership skills. It puts you forward as not only a supervisor but also as someone who is approachable, consistent in expectations and a possible mentor to others. Ready to get cracking compiling your own? Don’t forget you can download a quick guide to the sections and information to include as you get started by clicking here or on the image below. Would you as an educator or leader find this type of resource helpful? Let me know in the comments below or over in The Empowered Ed Community! Pin to come back to later!